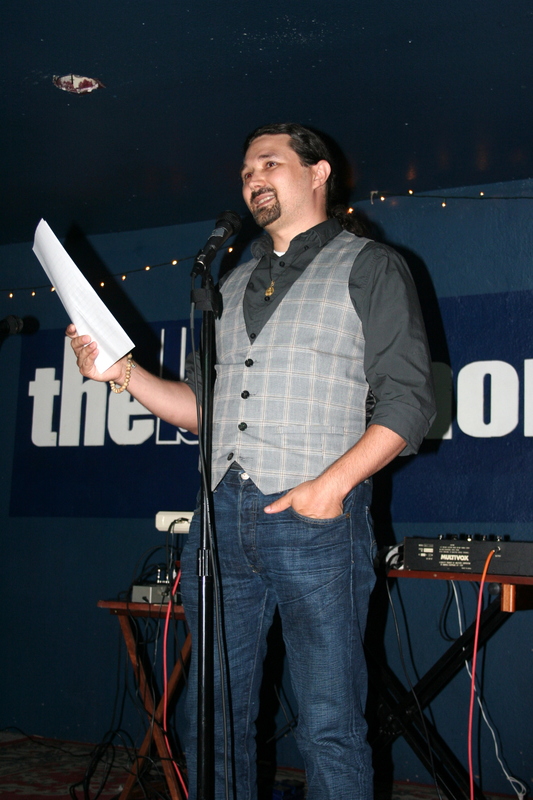 Reading fiction at The Blue Monk for the Ampersand West Coast Invasion! event, in Portland, OR, September 2012. Like most writers out there, I’ve been writing since I was a kid. I’ve been publishing fiction since my grad-school days, and now I’m the author of four books: my story collection, There Is No Other Way to Worship Them (Blue Cactus Press); my fiction chapbooks, Box Cutters (sunnyoutside press) and Where There Is Ruin (Red Bird Chapbooks); and my novel, Hagridden (Columbus Press). Thanks to Hagridden, I am a recipient of a 2013 Oregon Literary Fellowship. I also have been shortlisted in the Faulkner-Wisdom competition, twice for short fiction and once for my novella, and I have been nominated for a Pushcart Prize and was a finalist in the 2013 storySouth Million Writers Award. In 2015, I also was a contributor to the Sewanee Writers’ Conference. Because I like to preach what I practice (so to speak), I teach college writing and literature at Pierce College. I also give craft lectures and lead writing workshops. Want to invite me to your campus or your class, in person or via Skype? You’re welcome to email me with inquiries. I also serve as production editor for Jersey Devil Press and have served as the fiction judge for local literary contests in Oregon and Indiana. And, just for fun, I’m also a dedicated coffee addict and collector of smiley faces. I was born in Oklahoma but raised mostly in Texas; I’ve also lived in Oregon and Wisconsin, and I love to travel: in addition to driving much of the US, I’ve visited Mexico, Turkey, Canada, Scotland, Austria, The Netherlands, and Thailand. I also lived in Abu Dhabi, in the United Arab Emirates, from 2009 to 2011. Today, home is Tacoma, Washington, where I live with my wife, Jennifer, and our two cats, Ibsen and Brontë. You can contact me at snoekbrown @ gmail.com. That meant a lot, that was a hard piece to live, and tougher to write…. I’ve turned a corner, met the love of my life, devoted a blog to her (here on WordPress) and am moving to Texas, Jan. 30th. Through our limited correspondence on FB, you are one of a handful of people who held my head up over the last year, when it would have been easier to hang it. Much luck in all that you do…. Dude, Rob! Thanks, man — those are some damn kind words! Glad to hear everything is rocking right along now. What’s your new blog? I’d love to check it out. Also, where are you headed in Texas? I grew up there, you know, and I’ve lived or visited pretty much everywhere east of the mountains. Keep me posted, and great to hear from you! for that’s where she is…. The one I wrote about the evolution of our relationship is on wordpress: doishine. some may considerate is syrupy, but I am and always have been sentimental. I love “Colony”, Sam. I often wonder if I shared space with Westerberg, Ringenberg, Danzig, Cochran, and Mick Jones/Joe Strummer, if I’d feel like killing myself instead of being in a state of inspiration. Not that I am a musician, but I feel my writing flows more that way than in the way of the great published poets……..
Hey, thanks again! I had a blast writing those OBCBYL stories, and I need to revisit that vibe again. I’m working on a batch of others, not for OBCBYL but for various other pubs, but with the school year just now getting under way again, it’s been hard to find a good rhythm. Maybe this weekend I’ll get some good work done. I saw that earlier today and think it’s awesome! Thanks so much! Also, you and I live in the same city. We should hang out at a reading sometime. Hi! Thanks for dropping by my blog! Thanks for following my blog – I love that both you and your wife have such interesting blogs! Looking forward to reading future posts and catching up on old ones…. Your blog looks great! That reading underwater post made my skin crawl (oh no! all those books being ruined!) but the photos are so interesting I had to set aside my squeamishness at the wanton disregard for paper and just loved the whole thing. And, you know, Fitzgerald, who is awesome. I’m just stopping by to let you know that I truly enjoyed your “Potato” story, the one featured at The Writing Disorder. Gritty stuff. From the tiny tool kit to the cuff button to the trailing cigarette ashes . . . the balance of otherwise simple details with the family “dynamics” worked for me. Thanks. And I’m glad to discover your web site – plenty of groovy places to visit and bits to read. Hey, thanks, Robert! And I enjoyed your story, too — Vienna’s a great city, and your details brought back memories of visiting there. Great website, too. I’m not normally a mystery reader, but boy, your Sailor Doyle books look interesting! I couldn’t find a ‘contact me’ page, so I’m leaving this request here. If you would, can you do me a favor and re-blog my request for Submissions post? I figure you’ve got a good many more followers than I do. And I’d like to get the word out. Hope you’ll help, and thanks if you do. I’ll share it with my creative writing students, too. Thanks Sam for following my blog. Absolutely, I will be learning from your blog. Looking forward in reading your posts. Likewise, and I look forward to seeing your journey stretch out before you!